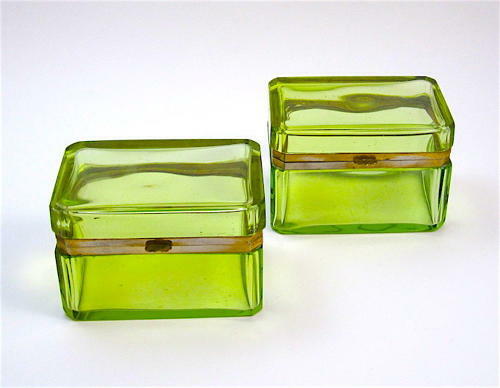 Pair of Antique Rectangular Uranium Glass Caskets with Bronze Mounts. Uranium Glass is Glass which has had Uranium, Usually in Oxide Diuranate Form, Added to a Glass Mix before Melting for Coloration.The Normal Colour of Uranium Glass Ranges from Yellow to Green Depending on the Oxidation State and Concentration of the Metal Ions, Although this May be Altered by the Addition of Other Elements as Glass Colorants. Uranium Glass also Fluoresces Bright Green under Ultraviolet Light.